Plastic, metal, and wire containers of numerous shapes and sizes. 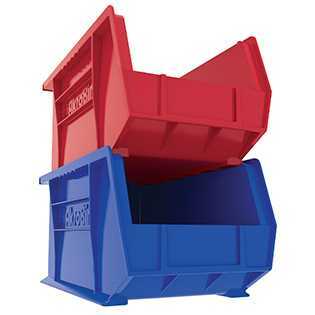 Warehouse storage bins come in hand carry sizes and capacities as well as forklift carry sizes and capacities. Your unique application may need plastic stacking bins, wire containers, or heavy duty corrugated steel industrial containers. Our professionals can assist you in determining which warehouse storage bins will be right for your application. We can also provide unique industrial containers such as metal pallet cages and containers designed specifically for your application. CSI provides industrial containers from warehouse storage bins to metal pallet cages.